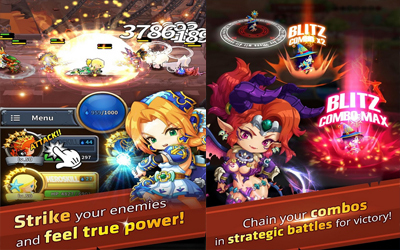 One of RPG games by Nexon is Medal Masters APK 1.3.2. You are promised of not get bored on the reason of repetitious battles. The learning system of the game will also guarantee you to have characters which could get stronger as soon as possible. The game offers you so many different heroes freely available to be used when you are playing it. You will be guided through so many dungeons full of weapons, armors, and, of course, treasures. You will be given a new immersive experience of RPG with ease of control and really dynamical combats. This Medal Masters for Android brings players into a fantasy land with a mission to rescue many heroes. There are total 245 different characters, who have been cursed from their past deeds. You have to fight and wind combats to make the heroes back to their normal self. You can make them join you as your company. You will be equipped with unique controls such as combo skill or Blitz control to enhance your strategic capabilities. You need the skills to have the strategic heroes’ compositions for a variety of combat tactics and strategies. And in this game, timing matters a lot. Blitz system enables you to focus on the exact time you need to boost your skills. This game offers one hand playing capabilities and real time RPG. You will be pampered with easy to control the game while still retain the immersive experience of new level RPG. You are also guided into utmost energetic combat experience featured with knockback system. There are always new challenges and no repetitive combat. You’ will also get in touch with new training system for quicker the power building. One of the most unique features is that when you are off from playing the game, you still can set your game in order that your heroes still continue their training and gaining more power. Therefore, prove your brain as the best tactician. Grab Medal Master for Android now. Develop and perfect your strategies through skills combo and Blitz control! Do not worry about repetitive battles that will leave you bored!